Our coffee has arrived for the cupping at Tazza D’Oro tomorrow (Sunday at 3 pm). Oliver has shipped us 16 different and amazing coffees from each of the growing regions – Indonesia, Africa, the Americas and a few special blends. 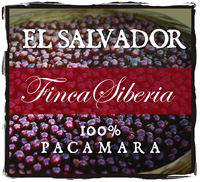 We are especially excited to cup the El Salvador Finca Siberia 100% Pacamara. This is a Limited edition coffee which we will be featuring at Tazza D’Oro. Batdorf and Bronson has once again out done themselves with this superior coffee. We have 3 spaces left for the cupping. You can email me at tazzadoro@earthlink.net if you would like to attend. The information on the cupping can be found on the previous post.